It’s been two months since my last post, but a cross-country move doesn’t happen quickly and I’ve just begun to get settled. I have to say that although quite brown, New Mexico is a beautiful and I’m loving the warmth. Today I wanted to talk about a very real threat for this time of year. (No its NOT the polar vortex, I have a feeling you’ve all read plenty about that.) I want to talk about ice dams, or ice jams as they as sometimes known. An ice damn on the San Miguel River in Colorado. Photo taken by Bill Masters in Placerville, CO on December 12, 2013. This is an example of a freeze-up dam. An ice dam is, quite literally, a naturally-occurring dam composed of ice. On a river, they occur when a free-flowing section of river runs into a section that is frozen over. This can occur when the downstream section freezes before the upstream section, known as a freeze-up dam. Another cause is the thawing of an upstream portion of the river before downstream sections; this is known as a break-up dam. During a break-up dam chunks of ice float downstream and pile up at the point of the dam. Dams can last for days or even weeks and cause serious flooding. 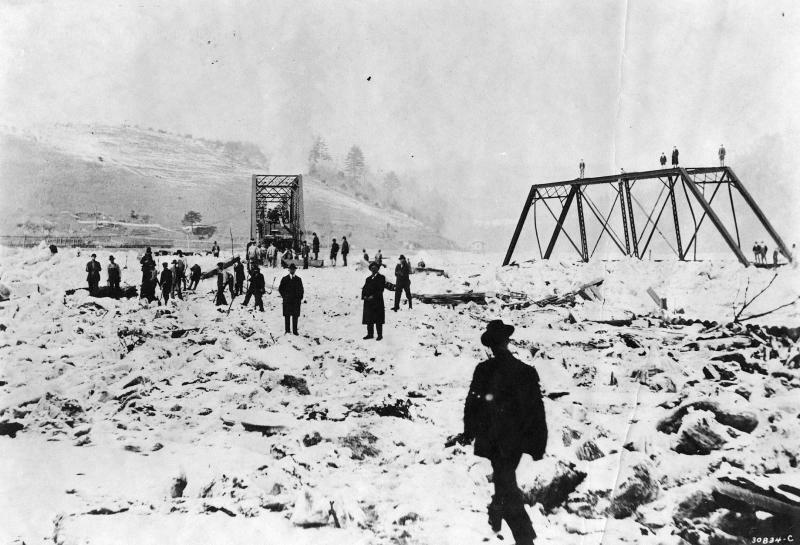 When a dam is serious enough, sometimes the only solution is to blast the ice with dynamite. Both of the triggers make northward flowing rivers such as the Red River of the North vulnerable. In the early winter, the northern section of these rivers are colder and this can cause freeze-up damns. In the early spring, warmer temperatures to the south can break up upstream sections first and cause break-up dams. These rivers make cities like Fargo, ND extremely vulnerable and you can get terrible springtime flooding like they did in 1997, 2009, and 2011. The Red River of the North flow north along the North Dakota-Minnesota border into Canada before dumping into Lake Winnipeg. Ice dams can occur in the winter or the spring, and different regions see these peaks at different times. In Massachusetts, where as a graduate student I did a study on ice dams, that peak comes in January and February. For other areas, particularly across the northern plains and more mountainous regions, the peak comes later. This is due to colder winters and melting snowpacks. 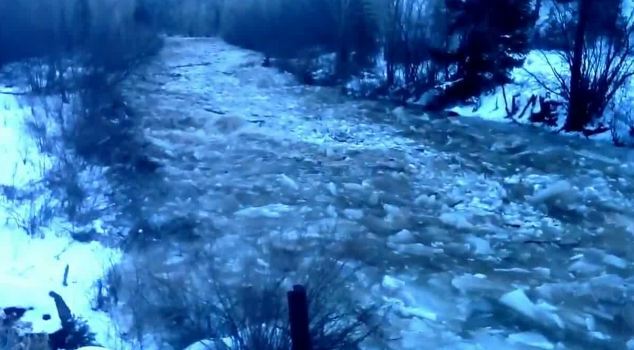 These peaks are typically break-up jams, when a combination of above-average temperatures and heavy rains melt a lot of snow and send huge amounts of water gushing into the rivers. Key times for ice dams include strong cold snaps during early or mid-winter, before many rivers and lakes have had the chance to freeze. Additionally, heavy rains and warm temperatures in late winter or early spring can cause particularly severe damns. In my study of Massachusetts ice dams, 20 of the 21 cases where multiple dams were reported were on days with temperatures above 40 degrees Fahrenheit. 14 of the 21 cases had temperatures above 50 degrees. For rain, 18 of the 21 had more than 0.2 inches of rainfall and 15 of 21 had more than an inch of rain. Just this month the extreme cold that inflicted much of the country caused quite a few freeze-up jams, one of which was on the Delaware River. River levels rose and roads were flooded out. For one of the new articles go here. Many people have never even heard of ice dams; a river can go decades between a serious dam and the risk can go ignored. If you live near a river that can freeze, even a small one or a stream or brook, you need to be aware and prepared. Flood insurance and an emergency plan are musts. If you’re unsure if your home is affected, check the FEMA Map Service Center. One thing involving the polar vortex: I know, I said I wouldn’t, but it’s involved. Climate change is going to increase climate variability; we will see more severe cold snaps due to a less-stable polar vortex. More events like the one we saw this month could increase the number of freeze-up we see. Similarly, more extreme warm events in the springs could cause more break-up dams. That concludes my polar vortex segment. 6 Day out Superbowl forecast: NWS says cloudy and in the 30s, so no blizzard. Could the Farmer’s Almanac be wrong?!?!?!?! See you next time everyone. Of course please follow, comment, e-mail, and follow on Twitter. Thanks for reading! ← Wildcard Weather is Moving!